"The Bonfire of the Manatees"
Dr. Caleb Thorn is a marine biologist working with manatees. 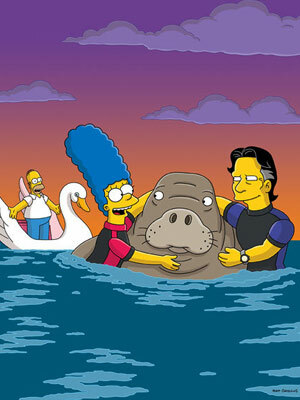 Marge Simpson meets Dr. Thorn, a good-looking scientist devoted to saving the endangered manatee species. Homer and the kids go to stay with their "country cousins" while looking for Marge (their dog is Santa's Little Helper's brother) who turn out to be much more modern and sophisticated than Homer believes. Meanwhile, Caleb helps Marge realise that Homer is the same man she fell in love with - the only problem is that she still expects him to change. Homer tries to win Marge back by saving a herd of manatees from a gang of jet skiers. He manages to talk the gang into leaving but is overheard calling them "Rubes". The gang turns around and starts beating up Homer. Despite his attempts to organise the manatees to attack the gang, they all flee. Luckily, Homer's country cousin shows up with a notarized court order which puts paid to the gang. Impressed, Marge declares she is taking home "the real endangered species: the devoted husband." Episode – "The Bonfire of the Manatees"
Modified on January 27, 2014, at 18:14.